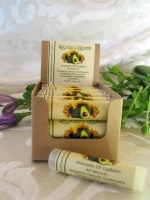 All natural, vegan formula enriched with Avocado Oil & Jojoba Oil, & a kiss of citrus essential oils to calm, soothe & moisturize dry, cracked lips. This is Candice's favorite...she says Bryce (her awesome 11 year old son) loves it, too! !